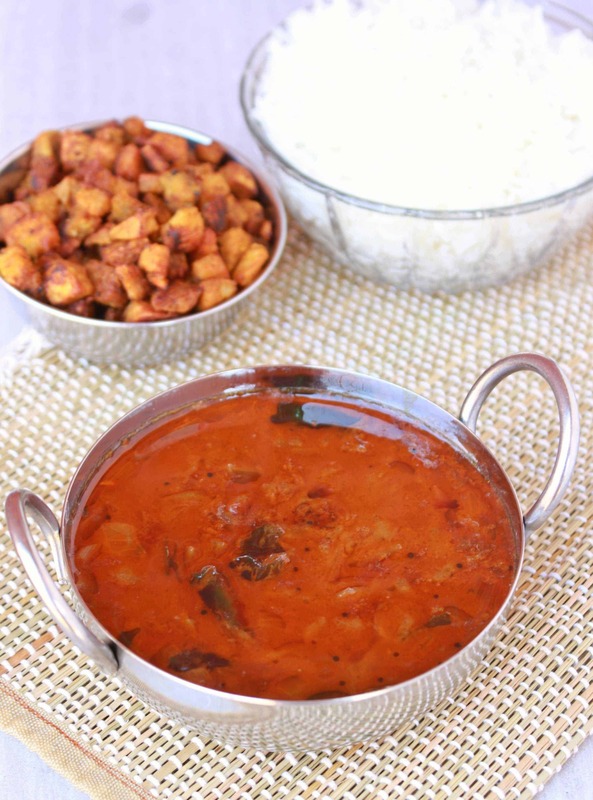 This week I am blogging about different rice and gravy dishes and after blogging about one of my favorite recipes from Northern India – Rajma Masala, today I move on to my hometown. My mother was very famous for her Vathal Kuzhambu and I can slowly start seeing hints of it in me. My boys love Vathal kuzhambu and there favorite is the Pumpkin Vathal Kuzhambu. 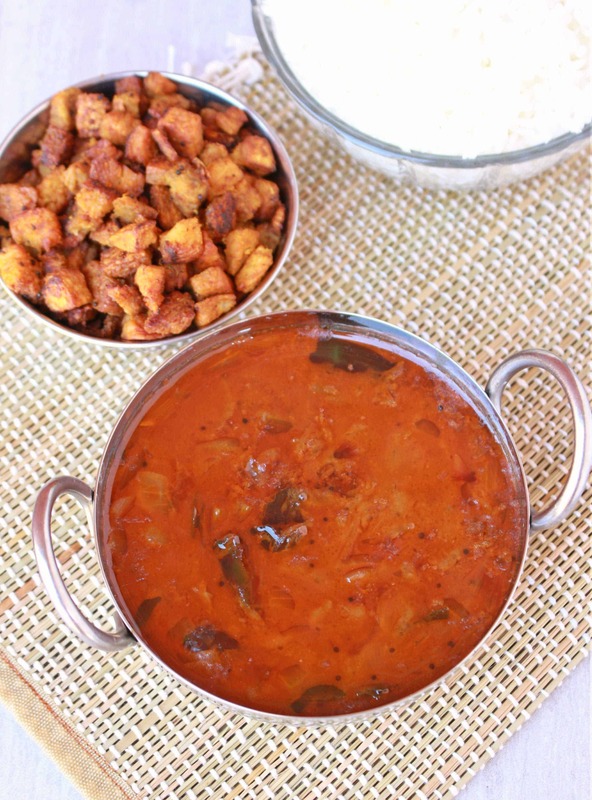 This Vengaya Vathal Kuzhambu is my favorite and even though I am a big fan of small onions, this particular recipe of Vengaya Vathal Kuzhambu, I like it with regular red onions. 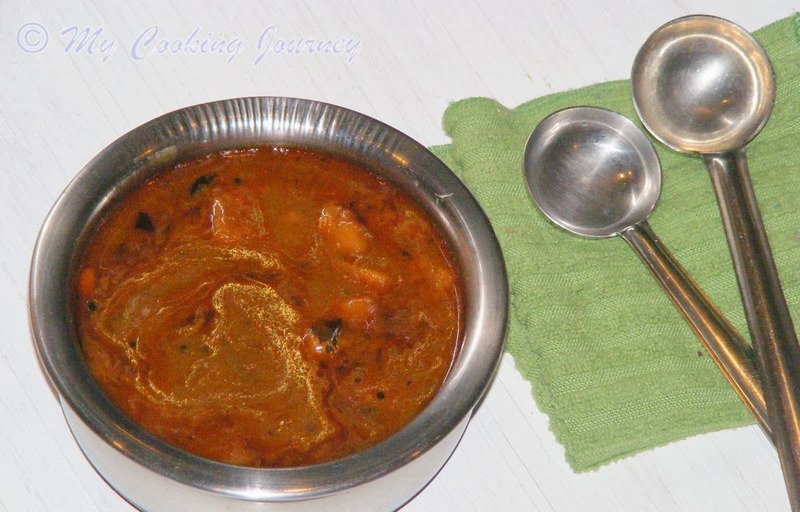 Anytime I make Vengaya Vathal Kuzhambu, my husband enjoys it for dinner rather than lunch as he says that the longer the Vengaya Vathal Kuzhambusits, the deeper the flavors penetrate and it tastes even delicious. That sloves my problem with left overs as no one minds eating this Vengaya Vathal Kuzhambu again the next day or couple of days later. But that brings the other problem, I can never have enough to store for leftovers! Few notes before I go to the recipe. 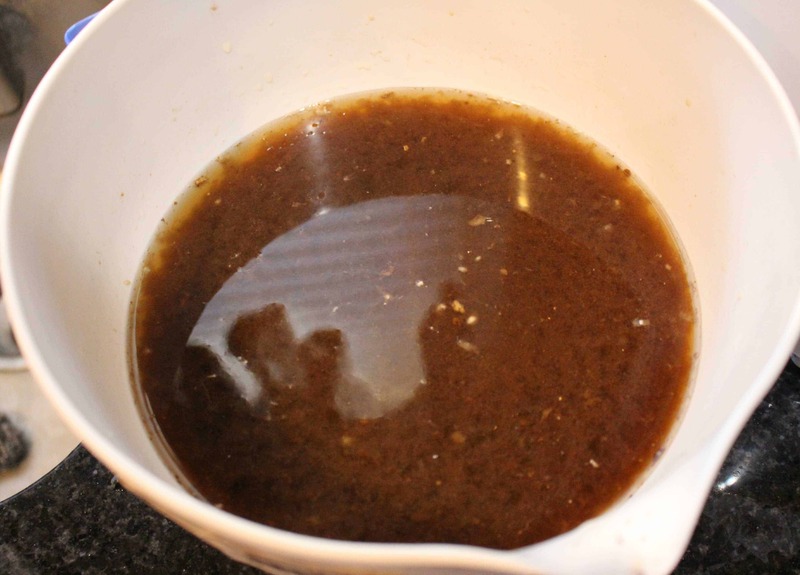 Make sure you extract juice from tamarind rather than using the paste. It definitely adds more flavor to the recipe. Also use gingelly oil if possible, as that adds to the flavor as well. I always add a bit of jaggery at the end and I would highly recommend it. Soak the tamarind in 2 cups of hot water for about 15 minutes. Squeeze the pulp well and extract the juice. Add 2 more cups of water to the squeezed pulp and extract that water as well. In a heavy bottom pan, heat the oil. I use gingelly oil for the flavor, but feel free to use oil of your choice. Add the mustard seeds and let it crackle. Then add the toor dal, red chilies and vendhayam (fenugreek seeeds) and fry for about 15 seconds. Add the chopped onions and saute it for about 2 to 3 minutes until they start to become aromatic. Now add the sambhar powder and give it a quick mix. Add the extracted tamarind water along with salt needed and curry leaves. Mix well and let it come to a boil. 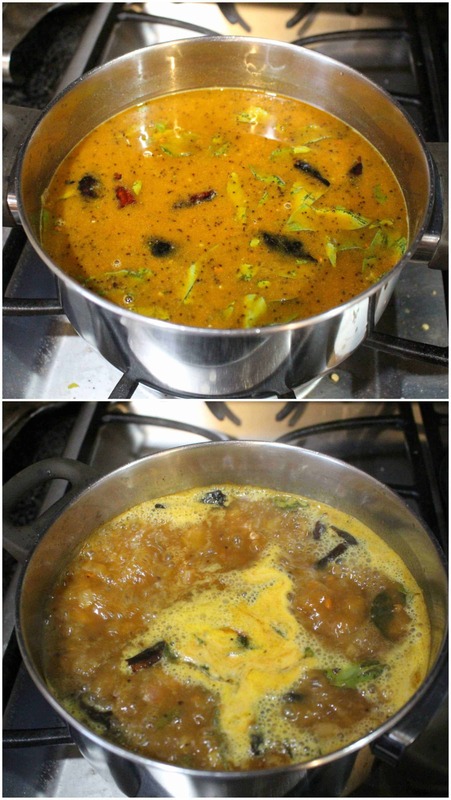 Simmer the kuzhambu and let it cook for about 15 to 20 minutes. 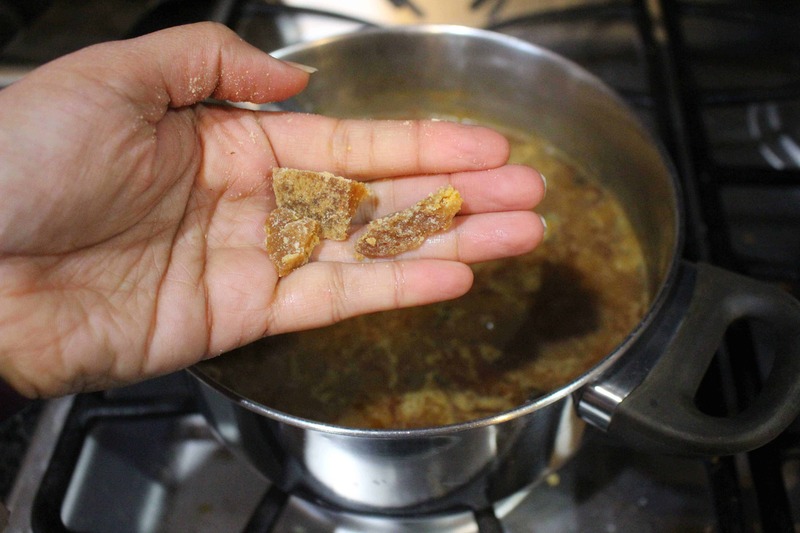 Add the jaggery to the simmering kuzhambu at this stage. Check the consistency of the kuzhambu. Depending on the quality of the tamarind, the kuzhambu could reach the desired thickness on its own, but sometimes we might need to add a little bit of rice flour emulsion to get it there. 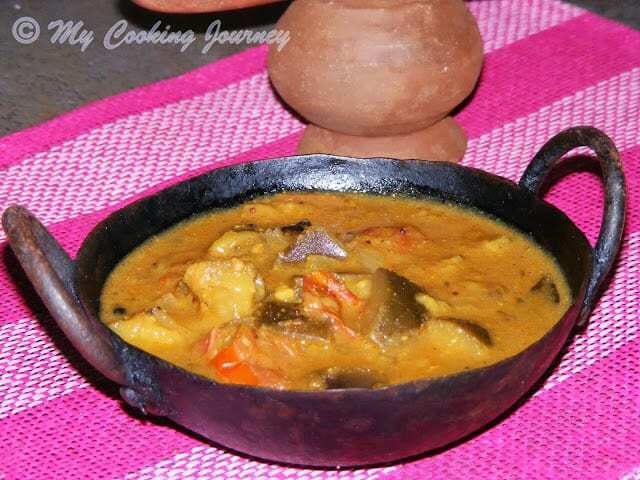 If the kuzhambu is not to your desired consistency, then add a little rice flour which is mixed with about 4 tbsp of water to the boiling kuzhambu and mix well. The kuzhambu will thicken and at this stage turn off the flame. Cover the pan with a lid to retain the flavor of the kuzhambu. 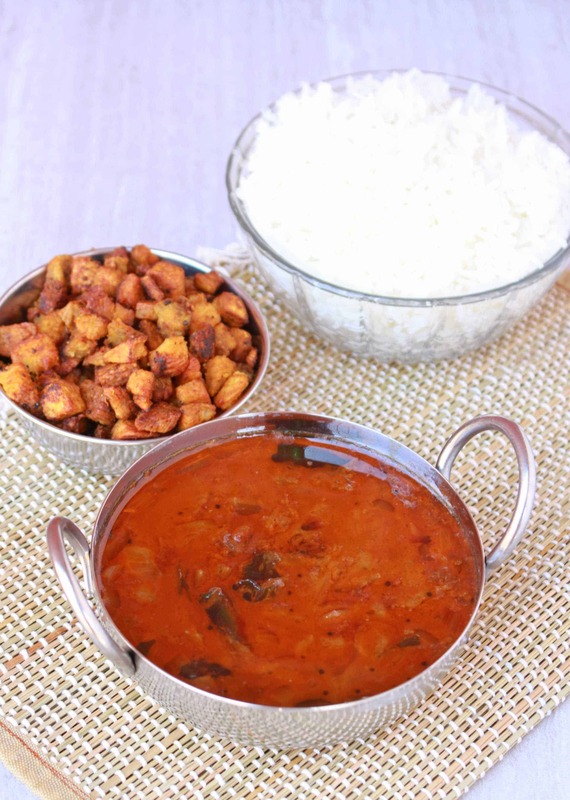 Serve with hot rice and ghee! 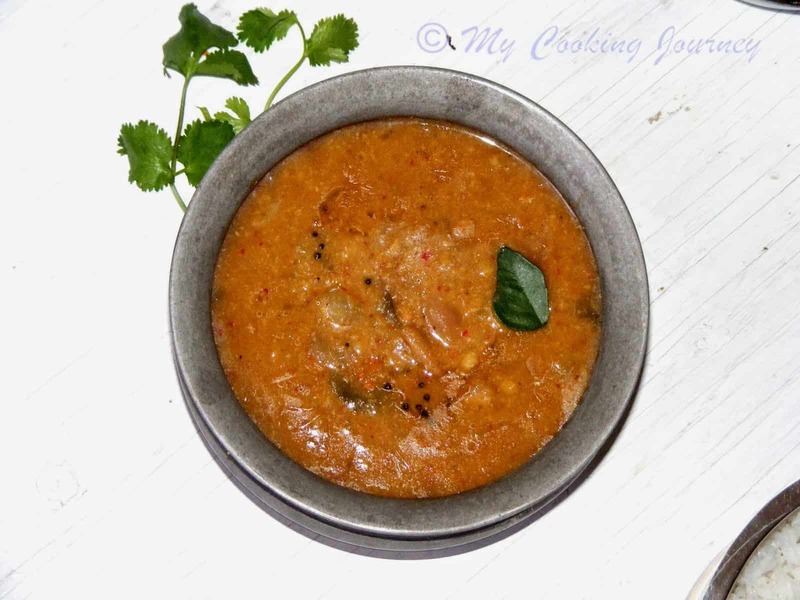 Tamarind based gravies always taste better few hours later or the next day. 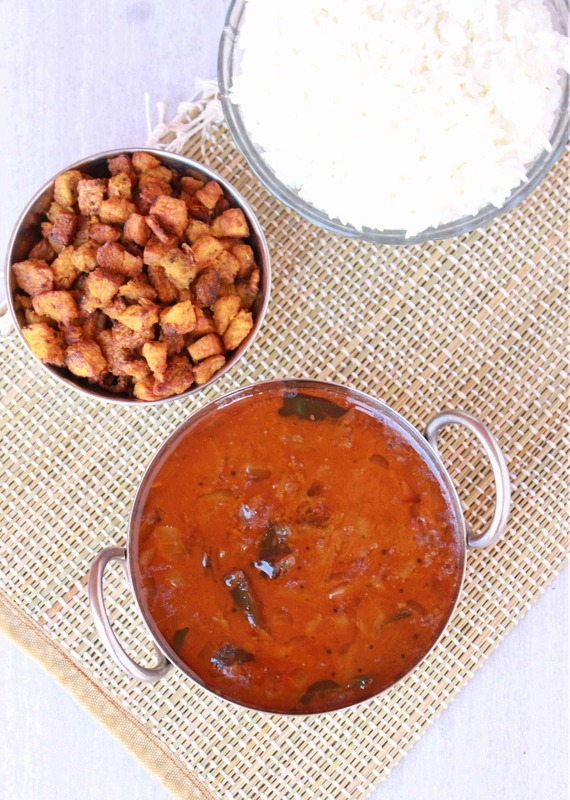 Kuzhambu looks good and a wonderful side dish to serve with rice. That looks sooo good Sandhya. I’m tempted to make this dish right away 🙂 I’m sure my whole family will enjoy this. Vatha kuzhambu with papads and ghee topped rice is quite enough to finish my lunch rite now. My mouth is just watering here, super tempting gravy. really my mouth watering while commenting. bookmarked. with tamarind I can feel the taste. 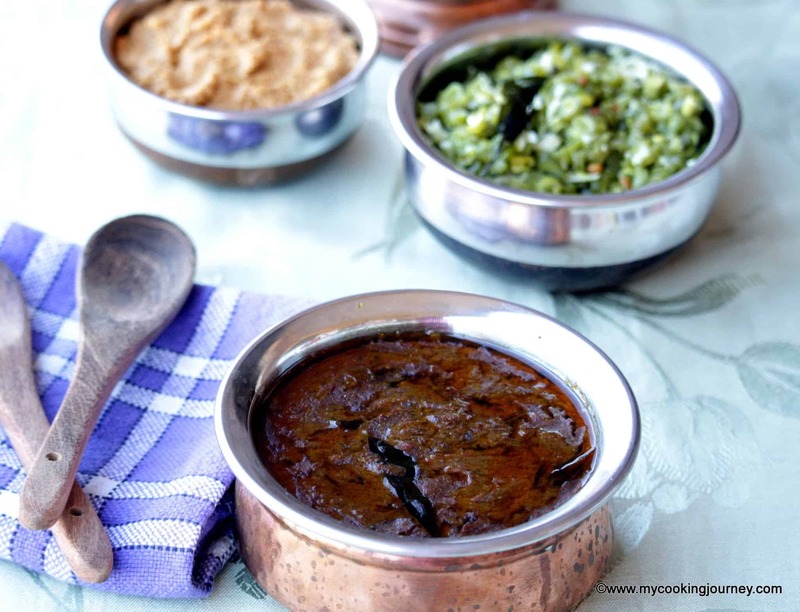 Its amazing how toor dal can be cooked in so many different ways. Your curry is definitely very tempting. I can imagine all the flavors meeting up with a bowlful of rice. yummy vatha kuzhambu ! our sunday staple with Potato fry ! Vatha kuzhambu is quite interesting. I have never heard about it as to us North Indians, South Indian food means certain famous foods like idli , dosa, upma etc. I’m finding this very interesting . Could you tell what will be the right consistency? I love tamarind based gravies. Lovely potato fry too. Awesome meal. 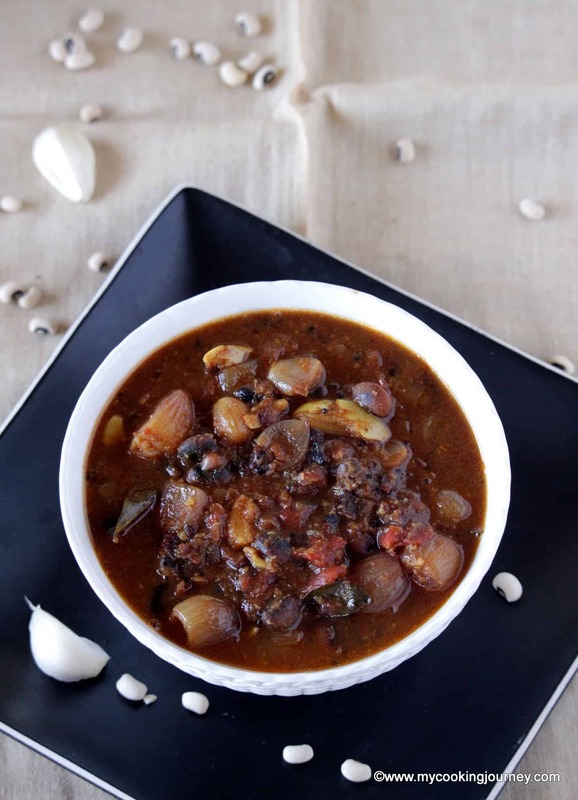 I love tamarind based curries and this khuzambu look irresistibly delicious. I am imagining how flavorful it would have tasted with rice. I’m drooling here, love the combo. My lunch for tomorrow is decided. Super! That looks amazing sandhya! The name vethakuzhambu itself makes me drool!! Steaming hot rice and a ladle of this deliciousness is all I need now!! Lip smacking good !!! Sandhya, thanks! This looks so simple to make, yet looking really satisfying and tasty!